I haven't done a Nail of the Day lately. I wanted to do something simple yet a little bit different. So I did a matte base color with a gloss design. For the base coat I used OPI Cajun Shrimp. 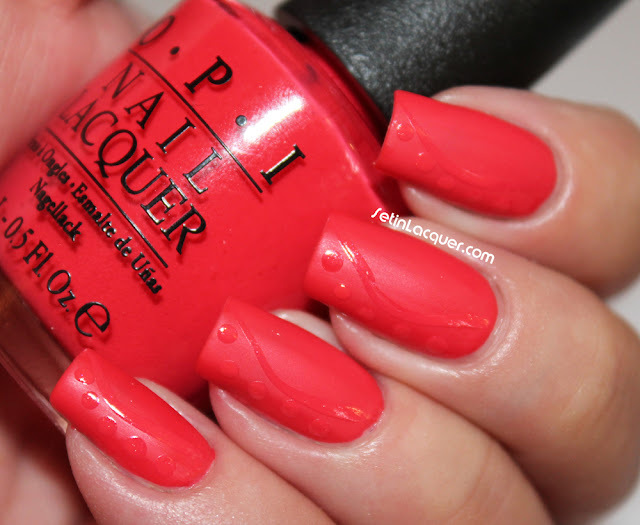 It's a gorgeous coral shade and applies flawlessly. Then I used a coat of Matte Finish Top Coat. I let that dry for a bit and then applied the design using OPI I Eat Manely Lobster. This polish is almost the same color but has a shimmer to it. The design was a simple dots and a "swoosh." I really like the contrast of the matte and the gloss. I have to admit though. I am spoiled with using my fast dry top coats. Have you used a matte and a gloss finish in the same mani?